On the edge of the Mediterranean - I propose to you my accommodation oriented full south, furnished with care, entirely renovated, with an area of ​​35 m ² with all the comfort (stereo, Bluetooth speaker, microwave, LCD TV, DVD, Nespresso and filter coffee machine, Hair dryer, toaster, ...). My apartment has a CENTRAL HEATING natural gas as well as a CHIMNEY bio-ethanol for a cozy winter. Are you coming by car? Be serene and enjoy a place of PARKING RESERVED and secured at the foot of the apartment. The access badge will be given to you at the same time as the keys. You may be loaded with luggage, which is why the elevator of the residence will prove a valuable ally. An open kitchen (American bar) and equipped will be useful and especially functional to prepare a good salad by returning just from the local market. The sofa bed in 140 (quality mattress) is available, which is added in the summer season (in the unheated loggia) a piece of furniture bed in 90 and another bed of 90 in addition. It is therefore of a capacity of 3 beds (see 4 pers.) In conformity with the regulation which is of 9 m ² by people. My apartment will be ideal for a couple with one or two children. In the entrance hall, a dressing room with a large wardrobe. An iron can be made available on request before your arrival. "THE MEDITERRANEAN SEA HAS HOLDER IN ALL SEASONS." To rent by the night, the weekend, or by the week. For any monthly rental, please request me to lift the 7-day restriction and allow you to book the monthly rental according to the price displayed. From my apartment; You are 900 m from the first beach, 1500 meters from the heart of the village, 500 meters from the Casino and only 300 meters from all shops including food open all the year ... and of course less than 10 minutes from Narbonne . Possibility of transport of the SNCF railway station within the limit of 2 persons without extra cost. ABRITEL is not a booking center like the others; This is definitely not a aparthotel! ABRITEL is a site that puts in relationship of simple owner who shares the love of their region and opens you, with their heart, their apartment with others who seek an authentic place to sleep. Through these experiences, boarders and hosts can establish real human relationships with people from all over the world. You can not therefore have the same level of requirements as a professional, and it is not the principle of ABRITEL where we want to give priority to communication and sharing with our guests. Reside in our own home. So I greet each of my guests in person, to make the tour of my apartment together before handing over the keys. Also be able to also exchange about my area that I love according to your needs and expectations. Be able to recommend the best wines and local tables in order to fully enjoy your stay without false notes. 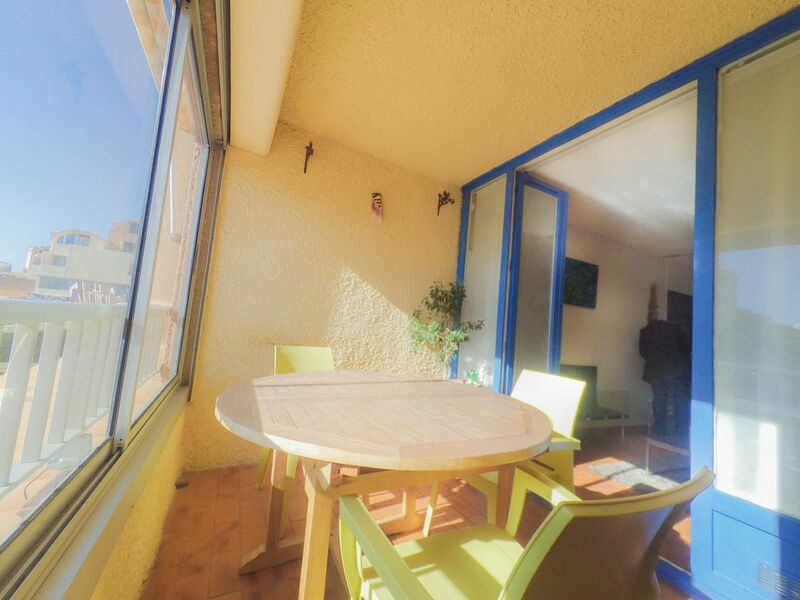 Our apartment has the advantage of being located on the Left Bank, which remains undoubtedly more lively, in the heart of the life of Gruissan and especially CLOSE TO ALL AMENITIES (shops, tobacco, ...) unlike Grazel and Right bank completely isolated and "desert". It is THE VIEW OF OUR APARTMENT WHICH HAS CHARMED AND SEDUCED to us with my husband, when we arranged. Our apartment is the opposite of many, which give them either directly on the street in R. D.C. or worse on large car parking and camper vans with their mufflers. A direct bus line (1 euro the way) drops you from the railway station to the door of my apartment. The bus stop is only 100 meters away. It is also possible to receive you directly at the Gare SNCF de Narbonne (under cover of the specification when booking and up to 2 persons). Check in time is 3pm and check out time is 1 pm and can be changed if the situation warrants. For your convenience, if you can not or do not want to take sheets, towels and soap, they will be provided for an additional charge of 20 euros payable on arrival and to be specified immediately upon booking. An iron can also be provided free of charge upon request at the time of booking. My apartment is a place of relaxation and rest. At ABRITEL you are not customer but INVITE with the obligations and duties that go with it. It is important to know that Airbnb is a community that is based on trust. When you select accommodation on ABRITEL, you know that you are staying at a particular home and surely not in a professional accommodation. I would be grateful if you would take care of that. My apartment is handed to you clean, so it must be returned clean (cleaning done before your departure). I expect from my guests the most basic rules of courtesy and respect: do nothing to deteriorate, make the place in the state in which it was entrusted, not make our apartment an illegal use (prostitution, ...) , Not to annoy my neighbors, not to be indiscreet in our place of life, and to warn us at the slightest problem. Any person who arrives in our apartment, however short it may be, of a person additional to those provided for in the initial booking must be subject to clear prior authorization from us. OVER-RENTAL IS PROHIBITED. As I personally do not smoke, I will tolerate you in my place of smoking ONLY to the window of Loggia. I took note that if you can not or do not want to take the linen (sheets, towels, tea towels, ...) as well as soap, they can be made available for an extra charge of 20 euros. Wifi internet access possible (not included). For July and August, the rentals are made only the week from the Saturday to the following Saturday. Pour votre confort, si vous ne pouvez ou ne souhaitez pas prendre les draps, serviettes de toilettes et savon, il vous seront fournis moyennant un supplément de 20 euros payable à votre arrivée et à préciser immédiatement lors de votre réservation.